Cost: $75 (includes open bar & live performances). I’ve said it once, and I’ll say it again; The Mckittrick Hotel’s Supercinema party series is New York nightlife at its finest. The Mad Hatter Ball invited guests into the world of Alice in Wonderland and it was filled with wonder, awe, and surprises at every corner. We were blown away with the creative costumes, the immersive set, and out-of-this-world atmosphere. If you haven’t been yet, Supercinema is a way to experience nightlife through a cinematic lens. 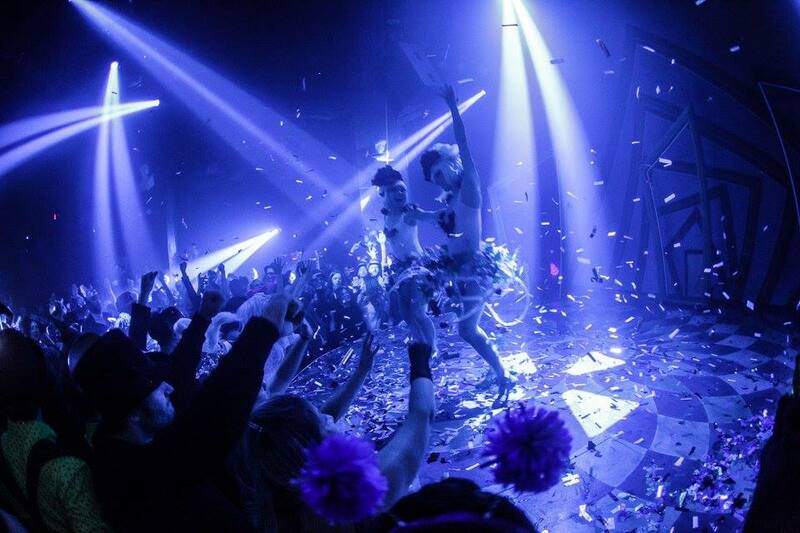 Starting this year, the party series has been held monthly at The McKittrick Hotel. It encourages guests to enter the world of film through an evening of costumed revelry and live theatrical performances. It also features an open bar for guests to enjoy all night long. Luis as "Tweedledee" and Francesca as "Alice"
As I entered the Mad Hatter Ball, I felt as if I was Alice herself; not knowing what to expect around every corner. The grand ballroom’s floor was shrouded with a carpet made of real grass, dancers spun and bobbed about the stage, and multi-colored confetti cascaded from the ceiling. It was the ultimate fantasy world brought to life. The McKittrick Hotel has many floors and rooms inviting you to come and play. Exploring the massive space was part of the fun, especially for the Mad Hatter’s Ball. As I ventured throughout the “hotel”, I discovered many hidden rooms including, a karaoke lounge, a casting room where one could audition for the movie (My line was “Off with her head!”), the Mad Hatter’s tea party, a graveyard (very spooky), a smokey Caterpillar Saloon, and many trippy rooms that left you in wonder and awe. All in all, the Supercinema party series is more than one could imagine. To attend their next event, A Great Gatsby theme, visit Supercinemanyc.com for more information.